Nominated for Audience Award European Director (Paul Greengrass), European Cinematographer (Ivan Strasburg), European Film (Arthur Lappin, Mark Redhead), European Screenwriter (Paul Greengrass), European Film Awards 2002. Paul Greengrass has proved himself to be a world leader when it comes to the blending of fact and fiction - he is perhaps cinema's most adept exponent of the 'docu-drama' approach, as he went on to prove with United 93 (2006), which was a far superior account of another day on which the world changed, namely 11 September 2001, than Oliver Stone's World Trade Center (2006). Only with The Bourne Ultimatum (2007) did Greengrass's first-person, eye-witness stance fail to work - the slickness of the narrative did not sit well with a gritty, faux-realist take. 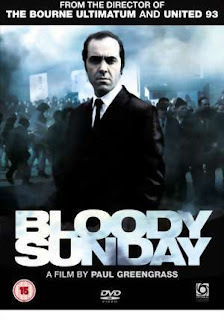 But he certainly scored with Bloody Sunday (2002) - anything less than the documentary style that was adopted to recount the events of that terrible day would have been more than insulting to the memory of those who died and those still alive who bear the scars. A dramatization of the Irish civil rights protest march and subsequent massacre by British troops on January 30, 1972 in Derry. Recounting the peaceful protest march to oppose British laws of the time that allowed internment without trial, the film charts events from the night before to the night after - lead activist Ivan Cooper (James Nesbitt) is at great pains to ensure that the march goes ahead peacefully, along with young Kevin McCorry (Allan Gildea), who has a prison record but who believes in the cause and also wants to avoid conflict. On the other side, Major General Ford (Tim Pigott-Smith) is arranging for a heavily armed troop of commandos in fatigues and face paint to be ready to intercept, should things turn violent. The march proceeds, chaos ensues, and the British militia opens fire onto the unarmed crowds, shooting 27 and killing 13. Tragically the rest, as they say, is history - there was no going back, and no hope for decades of a non-violent resolution to the Irish 'Troubles'. As with any historical document, truth must be sought on a personal level - it is of course impossible to say exactly what happened when, who fired the first shot, or whether any one side can be held completely responsible. Greengrass wisely presents both sides of the story without resort to saintly martyrs or pantomime villains - tremendous pressure had been applied to all involved, with British forces having to be seen as tough on terrorism, and the peaceful Irish activists also having to attempt to placate the IRA. Nesbitt in particular is excellent as the driven though compassionate march leader, and the credible sense of events spiralling out of control, thanks to a determinedly understated approach from all concerned, is a marvel. Happy viewing it isn't, but educational? Certainly.